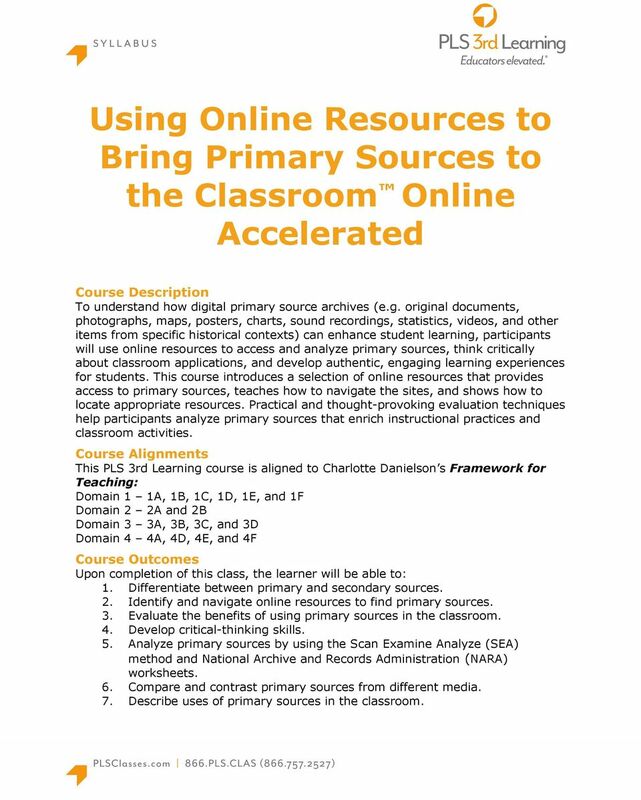 Download "Using Online Resources to Bring Primary Sources to the Classroom Online Accelerated"
1 Using Online Resources to Bring Primary Sources to the Classroom Online Accelerated Course Description To understand how digital primary source archives (e.g. 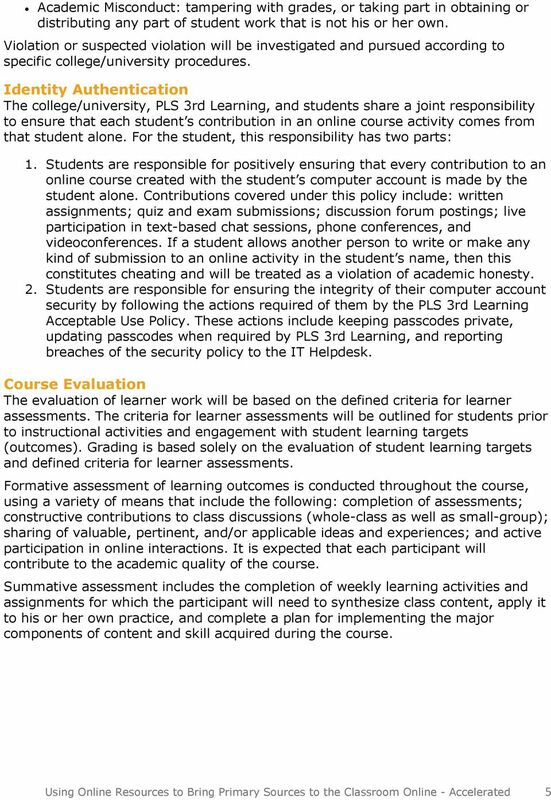 original documents, photographs, maps, posters, charts, sound recordings, statistics, videos, and other items from specific historical contexts) can enhance student learning, participants will use online resources to access and analyze primary sources, think critically about classroom applications, and develop authentic, engaging learning experiences for students. This course introduces a selection of online resources that provides access to primary sources, teaches how to navigate the sites, and shows how to locate appropriate resources. 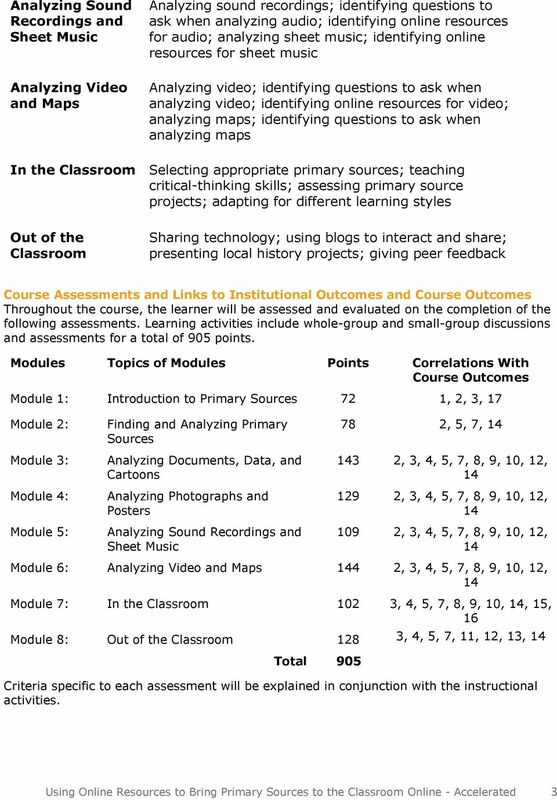 Practical and thought-provoking evaluation techniques help participants analyze primary sources that enrich instructional practices and classroom activities. 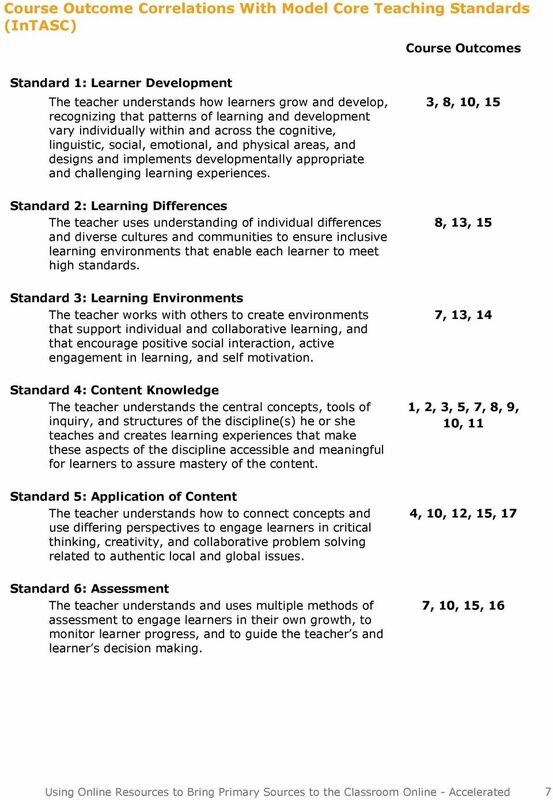 Course Alignments This PLS 3rd Learning course is aligned to Charlotte Danielson s Framework for Teaching: Domain 1 1A, 1B, 1C, 1D, 1E, and 1F Domain 2 2A and 2B Domain 3 3A, 3B, 3C, and 3D Domain 4 4A, 4D, 4E, and 4F Course Outcomes Upon completion of this class, the learner will be able to: 1. 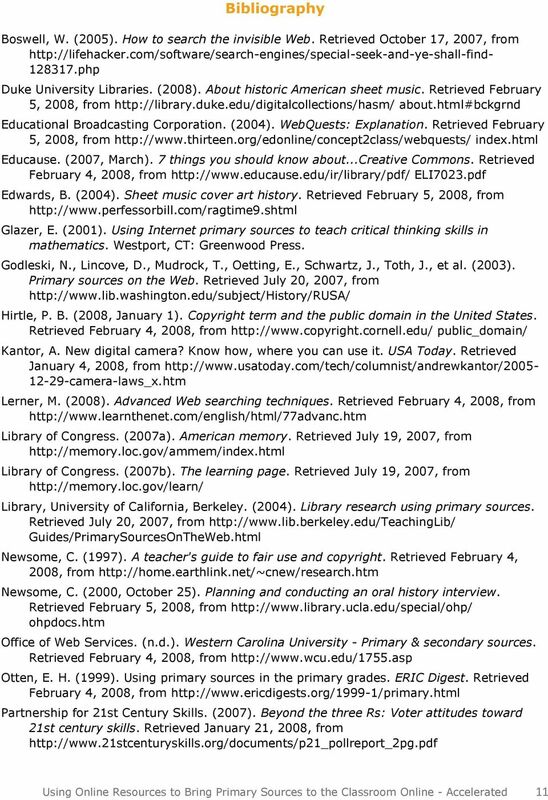 Differentiate between primary and secondary sources. 2. Identify and navigate online resources to find primary sources. 3. 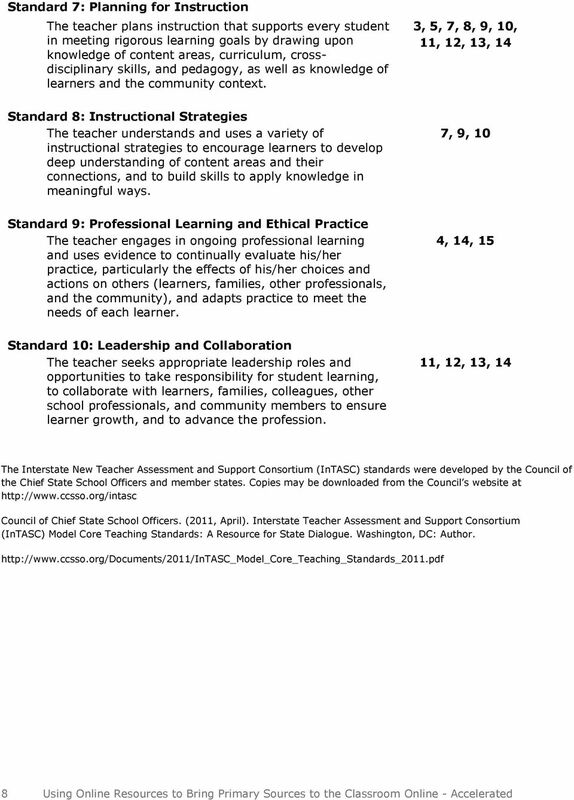 Evaluate the benefits of using primary sources in the classroom. 4. Develop critical-thinking skills. 5. Analyze primary sources by using the Scan Examine Analyze (SEA) method and National Archive and Records Administration (NARA) worksheets. 6. Compare and contrast primary sources from different media. 7. 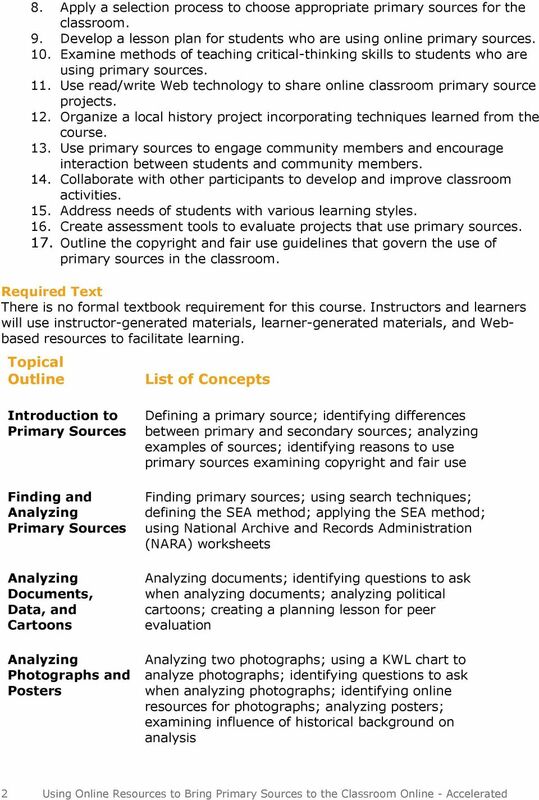 Describe uses of primary sources in the classroom. Reece, B.L., and Brandt, R. Human Relations: Principles and Practices, 7th Edition. Boston: Houghton Mifflin Company. Course Schedule. 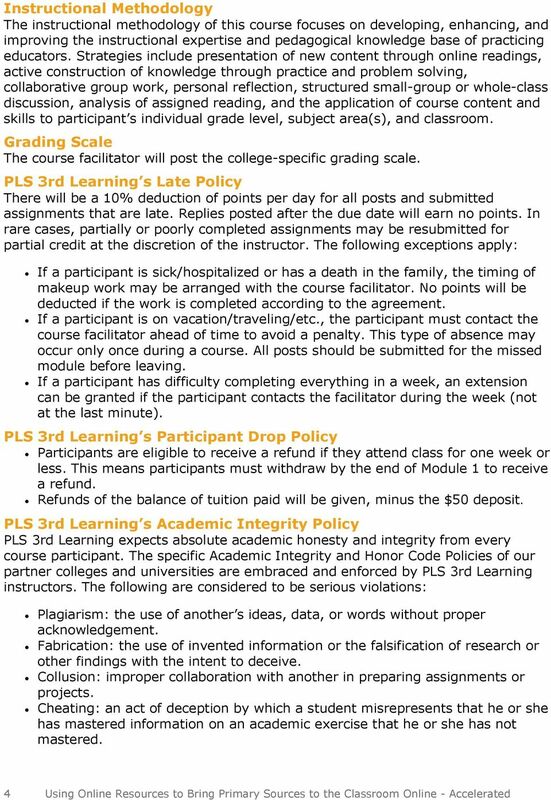 IMPORTANT: ALL TIMES EASTERN - Please see the University Policies section of your Syllabus for details.